You can only control 1 “Dakki, the Graceful Mayakashi”. When a “Mayakashi” monster(s) is Special Summoned to your field from the Extra Deck, while this card is in the GY (except during the Damage Step): You can Special Summon this card. 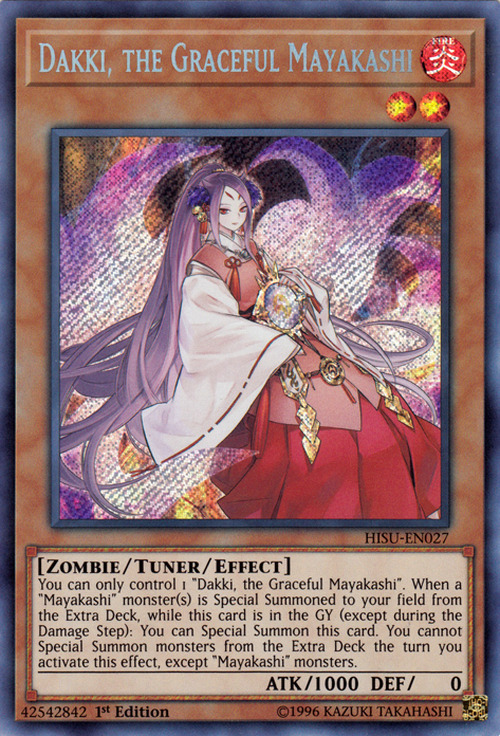 You cannot Special Summon monsters from the Extra Deck the turn you activate this effect, except “Mayakashi” monsters. Daji (pronounced Dakki in Japanese) was the favorite consort of King Zhou of Shang, the last king of the Shang dynasty in ancient China. She was, according to some accounts, notorious for alluring the king into a life of indulgence and cruelty, and entertaining herself by subjecting political dissidents to horrific forms of torture such as the Paolao (an extremely hot pillar for burning) or the Chaipen (a pit full of venomous snakes and scorpions). Therefore she has been portrayed as a villainous nine-tailed fox (a type of Chinese yaoguai, Japanese yōkai and Korean yogoe that disguises as a human to trick people) in various myths or novels, notably The Investiture of the Gods. Dakki, the Graceful Mayakashi is thus aptly depicted as a Japanese-style nine-tailed fox. This monster appears in the artwork of Mayakashi Return and Ghost Meets Girl - A Shiranui's Story. Yoko, the Graceful Mayakashi is the Synchro counterpart of this card.